The Datatool Uno RF compact self-fit immobiliser is suitable for any 12V motorcycle, ATV or Scooter and benefits from many features that you would only normally find on one of the top of the range systems. 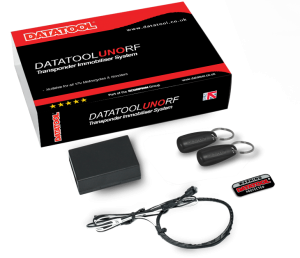 The Datatool Uno RF is an affordable single circuit transponder immobiliser designed to add a secondary layer of security to motorcycles, scooters or quads without a standard fit immobiliser or alarm. Ideal for the 125cc, commuter or scooter market that commonly don’t have any form of OE security, the Datatool Uno RF prevents the bike or scooter being started if the ignition is forced or hot-wired. Seamless in operation, a hidden antenna reads the code from the keyring transponder tag the instant the ignition is turned on and if the code is the correct one from a possible 18 trillion combinations then the immobiliser will disarm and allow the bike or scooter to be started. If the transponder tag is absent or the wrong tag is in range, the LED will flash rapidly to highlight the unit remains immobilised. In addition to the deterrent effect of the LED, the Datatool Uno RF is also supplied with a ‘Protected by Datatool’ decal to highlight to potential thieves that security is installed. Designed and manufactured in the UK, the unit is suitable for an easy DIY fitment by a competent mechanic or by a local dealer. Datatool Uno RF is supplied with two transponder tags but allows up to 5 tags to be programmed for added convenience. The PIN override capability with a factory programmed random PIN code allows the user to bypass the system if a transponder tag is lost. Although the Datatool Uno RF was originally intended for bikes or scooters without any standard fit security, it is also possible to use the product to add a secondary layer of security to supplement an OE immobiliser system. By installing the Datatool Uno RF in a ‘covert’ manner even if the vehicle keys were stolen, unless the potential thief knew where the antenna to disarm the system was hidden the vehicle would remain immobilised. Please contact us for more information.